Pace joins a distinguished list of former “Alumni Award” winners, including Alan Page (Notre Dame), Bo Jackson (Auburn), Tony Dorsett (Pittsburgh), Herschel Walker (Georgia), Mark May (Pittsburgh), Tim Brown (Notre Dame), Derrick Brooks (Florida State) and last year’s recipient Doug Williams (Grambling). 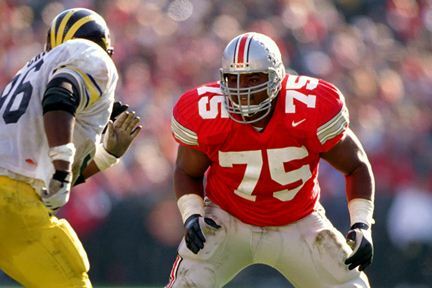 Raised in Sandusky, Ohio, Pace was a Parade All-American for the Sandusky High School football program and then attended The Ohio State University, where he was a four-year starter at offensive tackle and a two-time Walter Camp All American. He won the Outland Trophy (best interior lineman) in 1996 and was a two-time recipient of the Lombardi Award (best college lineman/linebacker). He was a finalist for the 1996 Heisman Trophy, finishing fourth in the voting. Pace did not allow a quarterback sack during his final two collegiate seasons. Pace’s play on the offensive line was so dominant – the term “pancake block” gained popularity during his time at Ohio State. In 1999, Walter Camp Foundation named Pace to their 50-player All-Century Team. Selected first overall in the 1997 NFL Draft by the St. Louis Rams, Pace was an immediate professional success – starting as a rookie. In 1999, he earned his first Pro Bowl berth and was named First Team All-Pro as the Rams won Super Bowl XXXIV. A model of consistency, Pace started all 16 regular-season games eight times during his professional career and was the cornerstone of the Rams’ offensive line. He was a five-time All-Pro and seven-time Pro Bowl selection. He was named to the NFL 2000s All-Decade Team. A member of the College Football Hall of Fame, Pace was enshrined into the Pro Football Hall of Fame in the summer of 2016. Involved in several business and philanthropic activities, Pace currently resides in St. Louis with his wife and four children.